I am positively settled on a 1911 platform after experimenting with a couple of alternatives. Now it's about 9mm or .45 I will shoot both for a while . Would like to hear opinions 1911 in 9mm or .45 . Its a no-brainer, if you're gonna have just one 1911 it should be a 45. I could argue your second one should also be a 45 as a backup. zanemoseley wrote: Its a no-brainer, if you're gonna have just one 1911 it should be a 45. I could argue your second one should also be a 45 as a backup. I own both . I hear some shoot 1911 9mm. You talking bullseye 2700 or service pistol ? Are they both bullseye grade 1911's? If not sell both of them and buy a good quality 1911 chambered in 45 by a reputable BULLSEYE smith. If they are both high quality I would still start with the 45 if you're new to bullseye and shelf the 9mm for a year or 2. The 9mm doesn't have enough advantages for a beginner to consider shooting both. Chris Miceli wrote: You talking bullseye 2700 or service pistol ? Service pistol. Any matches where both could be used. zanemoseley wrote: Are they both bullseye grade 1911's? If not sell both of them and buy a good quality 1911 chambered in 45 by a reputable BULLSEYE smith. Both accurised good 1911's. I You had two great BE1911's, what if any advantage one have over the other? 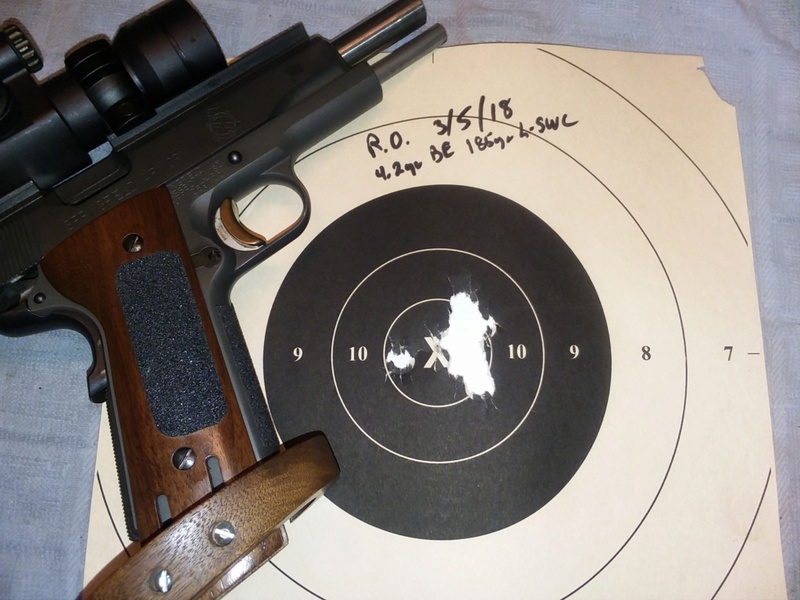 What’s a Bullseye grade 1911? A 1911 with all tool steel parts, high quality barrel that has been properly fit for accuracy and to reduce recoil, also properly throated and tuned for LSWC. A quality trigger job that yeilds a repeatable break and reset just over the weight requirement. Front checkering/stippling and textured grips for a solid hold. A solid rib or frame mount to provide foundation for a red dot or quality adjustable sights. 3" maximum groups with quality reloads, 1.5"-2" preferable. But I'm guessing you were being a smart a$$ about my terminology. I was. Makes me feel us lower grade folk don’t have a prayer in shooting good scores without a BE grade pistol. What ever happened to get a good RO and go from there? lablover wrote: I was. Makes me feel us lower grade folk don’t have a prayer in shooting good scores without a BE grade pistol. Well you sure can pick up a RO and go from there. But you may also get frustrated. Then you have a $750 pistol that really needs a $350 trigger job, $600 barrel job and $150 for better grips and a scope rib. Oh and might as well weld and refit the rails for another $200. Now you've got a $2050 range officer. I think you're better off going to a lightly used pistol that was built from the ground up to be a wadcutter pistol. Now if you just wanna dabble in bullseye and not sure if you're gonna like it then get a RO, worst case is at the end of the day you have a decent 1911 for your collection. Having quality tools is conducive to obtaining good results but is in no way a guarantee. Also I'm just speaking from MY experineces. I've owned 2 Les Baers, a Sig, a RRA and 3 custom 1911's including 2 45's and a 22 lower. If I were starting again today I would buy at minimum a used wadcutter pistol from RRA or a reputable smith if my budget allowed. I still believe in the Indian and not the arrow phrase. I've seen people barely break 700 with a $4500 Sams pistol. The pistol can't make you shoot. On the other hand Zins won't win nationals with a stock RO. So there's a bit of common sense that needs to be taken into account but good tools are always a nice thing to have. Stock RO in .45. Stock barrel, bushing, trigger and springs. Added a rail (30.00) and a used dot (170.00). Cheapo (17.00) rings and went shooting. To get my 9mm RO to shoot like that I had to turn it into a 38 Super. Also legal for EIC. That pistol would take you to Master and probably beyond. The .45 is a better choice if your only keeping one. I got to $2050 in my guesstimate above, guess I'm over budget. Chris, at what point does a person invest that? When a person is a SS? Expert? Stuck at expert. Being on a tight budget I’d rather use the funds for now for primers, powder and lead. When you become serious about being competitive.